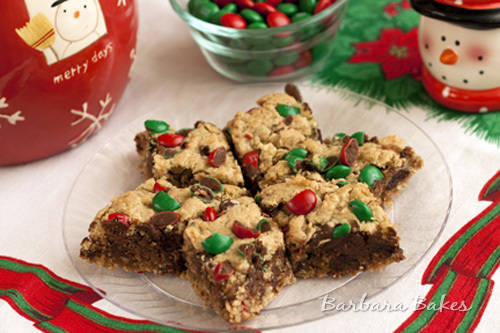 The rich, dense, chewy texture of a blondie, but these cookie bars are also loaded with chocolate chips, coconut, oatmeal and tart cherries, then topped with red and green M&Ms to dress them up for the holidays. 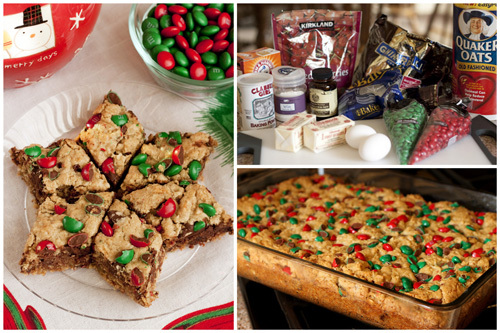 It’s a deliciously decadent bar cookie filled with all of my favorite cookie ingredients. I cut them on the diagonal to create the diamond shape. Pillsbury has a diagram on how to cut them, as well as other Secrets For Bar Cookies And Brownies. I created this cookie for a holiday cookie article in the new FoodieCrush magazine. If you haven’t checked it out yet, you need to. It’s so well done, the layout and photography are gorgeous. 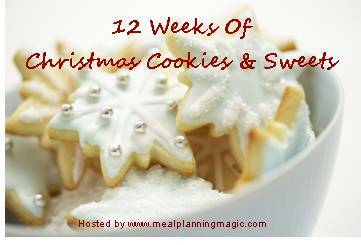 It’s a feast for the eyes, as well as loaded with fun articles, great recipes, and entertaining and gift ideas from talented food bloggers across the country. Spray a 9×13-inch baking pan with nonstick spray. Preheat oven to 350º if using a metal pan or 325º if using a glass pan. In a medium bowl whisk together the flour, baking powder, baking soda and salt. In a large mixing bowl mix the butter and brown sugar on medium speed until smooth and creamy. Reduce the mixer speed to low and beat in the eggs one at a time mix until well blended. Mix in the vanilla. Add the dry ingredients and mix just until blended. Stir in the oats, chocolate chips, coconut and cherries. Cool on a rack to room temperature before cutting. Optional: Cut bars on the diagonal to form diamonds. Hi Barbara! 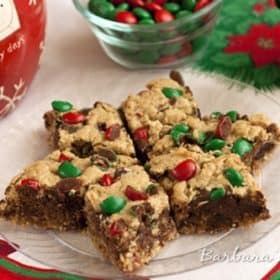 Made these for dessert on Christmas Eve, once again a huge hit 🙂 This time, instead of regular M&Ms, I used the coconut M&Ms and I highly recommend this sub to you and others! (for those of us who love coconut) This bar recipe is awesome. Hi Micaela. Love the idea of changing them up with Coconut M&Ms. Thanks! !